Occasionally a new producer seemingly comes out of nowhere and really grabs my attention. 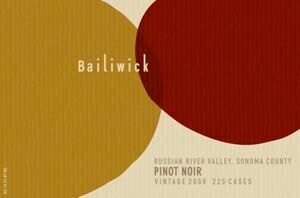 Four bottles of 2009 Bailiwick Pinot Noir recently showed up on my wine locker doorstep with no explanation attached. I was drawn to the attractive labels and the interesting sources for the wines. All the wines turned out to be stellar: it was like a gift from heaven. After consulting the website, I found that brothers Paul and Bryan Vais, natives of the San Francisco Bay Area, are the founders and vintners. They have been making wine in their basement and various garages for 25 years, gradually acquiring the knowledge to launch a commercial venture. They had successful careers in engineering, high technology and finance, but longed to enter the wine business. In 2009, they founded Bailiwick Wine Company, intent on sourcing premium grapes from specially chosen vineyards across multiple appellations. Their Pinot Noir winemaking regimen is as follows. Grapes are harvested before dawn, hand sorted at the winery, and 100% de-stemmed without crushing. A short cold soak in small open top fermenters is followed by inoculation of yeast. Punch downs are performed 2 to 3 times a day. Post-fermentation maceration is performed and the wine is pressed off into French oak barrels. The wines are racked once before bottling after spending 17 months in 20%-50% new French oak cooperage, appropriately matched to the fruit source. 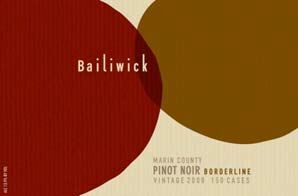 Four 2009 Pinot Noirs and a 2010 Vermentino are the inaugural Bailiwick offerings. The Pinot Noirs are impressive inaugural releases, displaying deft winemaking. The wines are bright and uplifting with modest alcohol and welcoming acidity, making them easy to recommend. The owners are foodies and this shows in the suitability of their wines for the dinner table. Visit the well-organized website at www.bailiwickwines.com where the wines are available for purchase. 13.9% alc., pH 3.52, TA 0.62, 150 cases, $34. Sourced from Chileno Valley and Kendric vineyards in the Marin County AVA. Chileno Valley Vineyard is farmed by Mark Pasternak (owner of Devil’s Gulch Ranch and Vineyard) and Kendric Vineyards is managed by Stewart Johnson (Kendric Vineyards wines). Swan selection, Dijon and Pommard clones. Aged 17 months in 44% new French oak barrels. · Moderately light reddish-purple color in the glass. Nicely perfumed with cherries, strawberries, spice and dried rose petals. Red-fruited, featuring lighter-weight flavors of cherries, raspberries, sandalwood, baking spice, leaf and tobacco. Crisp, with good acidity and polished fine-grain tannins. Very good. 14.2% alc., pH 3.58, TA 0.64, 225 cases, $36. 57% Maurice Galante Vineyard located in the Green Valley of Russian River Valley and 43% O’Neel Vineyard situated in the Santa Rosa plain. Clones are 115, 777 and Pommard. Aged 17 months in 20% new French oak barrels. · Moderately light reddish-purple hue in the glass. Enticing aromas of dark red cherries, berry jam on toast and wooded forest. Medium-weighted flavors of fresh cherries, cola, and leaf framed by soft tannins and bright acidity, finishing with some persistence on the pleasing finish. Not impressive on the attack, but leaves a good impression. Good (+). 13.9% alc., pH 3.68, TA 0.62, 50 cases, $44. This vineyard is situated at 1,500 feet above the Salinas Valley floor at the front door of the Pinnacles National Monument. Decomposed granite and limestone create a soil profile ideal for Pinot Noir. Farmed by noted winemaker and winegrower Michael Michaud, the masterful vintner behind some of the memorable Chalone Pinot Noirs of the 1980s. Aged 17 months in 50% new French oak. The microclimate is challenging, offering little rainfall and extreme diurnal temperature variations. Crop yields are painfully low. · Moderate reddish-purple color in the glass. Nicely endowed perfume of blackberries, plum reduction sauce and Herbs de Provence. Delicious black raspberry and blackberry core that is intense on the attack, finding every nook and cranny in the mouth, and persisting on the earth-kissed, chocolaty finish. Clean and pure, with bold tannins that are typical for this vineyard. Very good (+). 13.7% alc., pH 3.63, TA 0.63, 50 cases, $44. This vineyard is located at 900 feet elevation overlooking Bennett Valley on the northwestern flank of Sonoma Mountain. Clone 115 planted in 2000 by owners Norm and Carole Silverman. Loamy-clay soil is low in vigor, naturally limiting yields to about 2 tons per acre. Aged 17 months in 30% new French oak barrels. · Moderately light in color. The nose is redolent of fresh berry jam, spice box and subtle oak that really draws your attention. Sinfully delicious flavors of fresh-picked dark red berries with a complimentary oak (vanilla, coffee) underpinning, leaving an impression on the vibrant and dry, berry-relish toned finish. A charming wine that combines power with finesse. My tasting notes say, “Wow,” and that clearly sums it up.